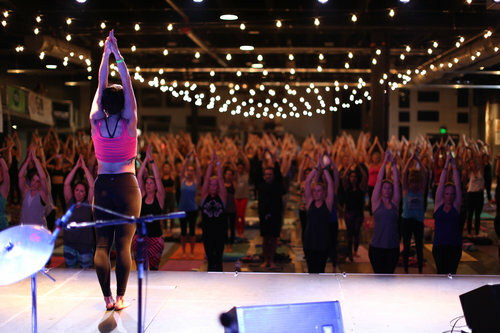 The Music City Yoga Festival is Small World Yoga's annual fundraiser and celebration of yoga, fitness, and wellness in Nashville. Join us for another year of yoga, vendors, live music, local food, and a few new surprises. The 2018 MCYF proceeds will support Small World Yoga, a Nashville non-profit with a mission to connect people and create community by increasing access to yoga. Currently, SWY's growing team of 130+ instructors serve 150+ children, women and men at 70+ Nashville-area locations! Classes vary from summer and after-school youth programs, to all-ages public library sessions, to recovery groups for adults and seniors. Since 2014, SWY has reached thousands of participants, sharing the enjoyment and benefit of yoga to our diverse Nashville community. Use the code "LIGHTNING5" to get $5 off the GA ticket, or use "LIGHTNING10" to get $10 off the Yoga+Spin ticket. There are limited amounts of codes so sign up today! Price: $40 for GA, $55 for GA+Spin --> use your Team Lightning code to get a discount! Registration: Get your tickets HERE! Pets: No pets allowed with exception made for service animals.